This review first appeared in the February 1, 1993 issue of the North County Blade-Citizen (now North County Times). Is he really only a quarter-century old? It seems impossible that one so young could have impacted American music on so grand, so broad, a scale. And yet here is Harry Connick Jr. at age 25, having replaced Frank Sinatra as the epitome of the suave, sophisticated urban American male vocalist. 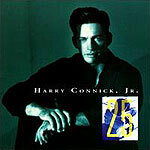 Interestingly, Connick uses the moment of his five-year anniversary of his national debut ("20") to explore his New Orleans roots, with some raw, sassy piano playing and rough-hewn vocals that recall more the bluesy side of jazz than the upper-crust sophistication of Sinatra's big band material. Connick performs mostly in a setting of solo piano and vocals here, joined occasionally by some of his fellow Crescent City musicians, including vocalist extraordinaire Johnny Adams and pianist Ellis Marsalis (who was Connick's piano teacher when he was a boy). The rawness of his playing here is even more surprising when you consider the material Connick covers here: "Stardust," "On the Street Where You Live," "Lazybones." The composers featured on the album include Ellington, Mercer and Carmichael. But this melding of a raw, bluesy performance with some of America's best-known pop and jazz songs only serves to emphasize Connick's continued  and continuing  growth as an artist. He is at the point in his career where simply by performing a song he rebuilds it and lets us see new dimensions to the genius of those who wrote the songs he covers. In the end, this album leaves us hungry for and looking forward to markers at 30, 50 and beyond.